Happy New Year of the Snow Leopard! 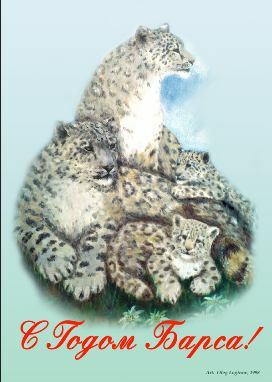 I’ve received a lovely email from Oleg Loginov, Director of the Snow Leopard Fund Kazakhstan who tells me while the Chinese now celebrate Year of the Tiger, in Kazakhstan and other parts of Central Asia they are celebrating this as year of the Snow Leopard. Go Snow Leopards! By the way, in this part of the world snow leopards are called Bars! It’s estimated there are between 100 – 200 snow leopards in Kazakhstan and Oleg’s SL Fund will do research and conservation and education work to help protect them. We hope it will be a wonderful year for snow leopard conservation and that many more people will learn to love and support this cat in the wild. It would be good if Borat donated some money for the Snow Leopards in Kazakhstan? Yes Amber, there are still some snow leopards left. The exact number is not known but that’s the sort of research that Oleg’s Snow Leopard Fund Kazakhstan will do. I hope they find that there’s still a good number to keep a viable population going there for many years to come. That would be a lovely celebration for Year of the Snow Leopard there.